Known as the northern flickers, the Yellow-shafted Flicker and the Red-shafted Flicker are very similar woodpeckers. 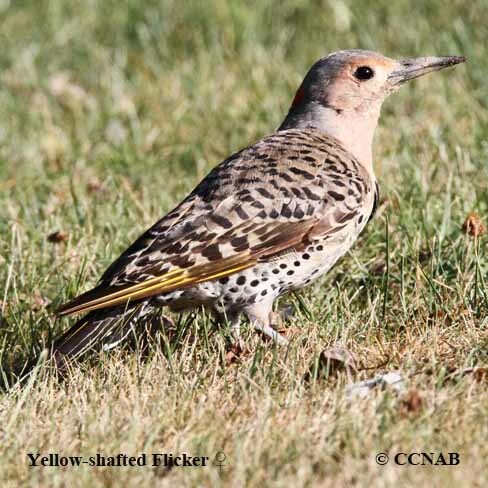 The Yellow-shafted Flicker is found in the eastern half of North America whereas the Red-shafted Flicker is found in the western half of the continent. It is not unusual for the two types of flickers to mix in the central regions of North America where they become a more common type of flicker. The Gilded Flicker is found in the southwestern states and lives in a much warmer and arid climate. Flickers are more apt to be seen feeding on the ground as opposed to other types of woodpeckers that mainly feed on the surface of trees. Beetles and ants make up most of the flicker's diet.